To elucidate feasible routes of producing CO from CH3 and unravel the effect of adsorbed O on CHx transformation, the reactivity of CHx (x = 1–3) with and without the assistance of adsorbed atomic O on Ni(111) was explored using density functional theory calculations. The adsorption energies of CHx (x = 0–3) were found to be significantly reduced on an O-preadsorbed Ni(111) surface compared to a pure surface. Furthermore, O-assisted one-step dehydrogenation of CHx (x = 1–3) features energy barriers and thus is difficult to proceed. In terms of energy, the direct dissociation of CH3 is favorable, except for the last CH dehydrogenation, which is energy intensive. Interestingly, in O-assisted two-step CH transformation to CO via CHO intermediate, the barrier is dramatically lowered. The successive dehydrogenations of CHxO (x = 1–3) were also found to be a route for CO formation. Finally, two possible pathways from CH3 to CO are proposed: (a) CH3 → CH2 → CH → CHO → CO; (b) CH3 → CH3O → CH2O → CHO → CO.
Methane, the principal component of natural gas, has been a high-quality raw material for the production of various fuels and chemicals in the past several decades [1, 2, 3, 4]. Methane conversion is realized mainly by two strategies, which are the direct and indirect processes. Although great achievements and progress have been attained in the direct activation of methane to chemicals [5, 6, 7], there is still much to do to realize industrial operation. Currently, only the indirect process via syngas as platform molecules is operated commercially. As an alternative to steam reforming of methane, partial oxidation of methane (POM) to syngas has attracted much attention [8, 9, 10, 11] because of mild heat release and a H2/CO ratio of 2, which is very suitable for methanol synthesis and Fischer–Tropsch synthesis. Among the series of catalysts developed for POM, Ni-based catalyst is the most popular because of its properties, such as good catalytic performance, rich resources, and low cost [8, 12, 13, 14]. In contrast to the numerous studies on the improvement in catalysts and evaluation of their catalytic performance for POM, less attention has been given to the mechanistic understanding of this process, and the mechanism of POM remains ambiguous [9, 15, 16]. Since experimentally tracking the details of transient transformation process is challenging, researchers have attempted to employ first-principle density functional theory (DFT) to unravel the reaction pathways. Many studies have reported the adsorption and dissociation of methane on Ni-based and other transition-metal catalysts [17, 18, 19, 20, 21, 22, 23, 24, 25, 26, 27, 28]. These studies further clarify the catalytic processes involving methane decomposition but are not extensive enough to demonstrate a full scheme of POM, because they do not consider the effect of adsorbed O, which plays a significant role toward the product CO [29, 30, 31]. Liu et al. [18, 19] investigated the adsorption of CHx (x = 0–4) and the dissociation of CHx (x = 1–4) on NiCo(111) facets of ordered NiCo alloy. They also investigated the dissociation of CH4 on NiCu(111) surface and later investigated the adsorptions of CH4, CH3, CH2, CH, C, H and dissociations of CH4, CH3, CH2, CH on the (111) catalyst surfaces of NiFe. They found that segregated NiCu is the best among the eight CH4/CO2 reforming catalysts Fe, Co, Ni, Cu, NiFe, NiCo, NiCu, and NiCu(S). Li et al. [21, 22] studied the dissociation of CH4 on NiM(111) (M = Co, Rh or Ir) surface using the DFT. Shen et al. studied primary dehydrogenation of methane on the (100), (110), and (111) active facets of single-crystal metal catalysts of the Co group (Co, Rh, and Ir) and Ni group (Ni, Pd, and Pt). In their study, the main concern was the difference in the catalytic mechanism of alloys and pure metals. Their research was aimed to study the change in the electronic properties of the catalyst surface after alloy addition, and the influence on the reaction process of the element. It was found that when the catalyst was an alloy, it had a positive effect on the dehydrogenation reaction with methane. Moreover, the mechanism of the alloy was proposed to be capable of effectively inhibiting carbon deposition compared to pure metals because a good catalyst should have a moderate d-band center. This can give us insight into the factors controlling carbon deposition and assist in designing the optimal catalyst. In our preliminary work in the laboratory , we studied the adsorption and dissociation of methane as well as syngas formation over Ni(111) and NiPt(111) to understand the effect of Ni(111) surface alloying on POM. The results showed that Pt-doped Ni(111) surface is beneficial to the adsorption of CHx and H species and unfavorable to the desorption of H2. However, in the above research work, the catalyst was considered only based on a smooth surface. In the actual reaction process, the surface of the catalyst adsorbs a large amount of O atoms; the effect of O atoms on the gradual dehydrogenation of methane was not considered in the above study. To the best of our knowledge, the role of adsorbed O atom during POM in the literature is controversial. Wise et al. [33, 34] found that the activity for methane reaction significantly increased due to the presence of preadsorbed O atom on Ni(100) and Ni(111), while Alstrup et al. pointed that oxygen had no clear enhancement effect on methane dissociation on Ni(100). Valden et al. concluded that in the presence of atomic O, methane dissociation could be poisoned due to a steric hindrance of active adsorption sites. Au et al. reported that oxygen promoted methane dissociation on Pt, Cu, Ag, and Au when atomic O was at hollow sites. Several recent studies [38, 39, 40] highlight that the reactivity of surface O depends on the nature of the transition-metal surface employed, and the oxygen-promotion effect is beneficial to lower-activity metals as opposed to higher-activity metals. Inspired by these results and doubts, in this work, we explore adsorbed oxygen-mediated transformations of CHx (x = 1–3) to CO on Ni(111) through DFT calculations. The aim of this study is to identify the effect of adsorbed O on CHx conversion and screen the possible pathways of producing CO from CH3. In this work, the reactant begins from CH3 instead of CH4 because of the following considerations: CH4 is physically adsorbed on the surface and is basically unaffected by the adsorbed O; as a result, the initial dehydrogenation of CH4 proceeds mainly through a direct route. Moreover, CH3 is a common intermediate with general interest in catalytic partial oxidation of hydrocarbons and many theoretical works have been published relating to CH3 species [41, 42, 43, 44]. The Ni(111) surface was selected as the catalyst model because it is the most abundant and frequently exposed among all the crystal planes of Ni metal. This paper is organized as follows: In the first section, the details of calculation methods and models are introduced. In the second section, the adsorption of related species and O-assisted two-step and O-assisted one-step dehydrogenations of CHx (x = 1–3) are presented in detail; then combined with our previous study, the results are analyzed and compared. Concluding remarks are given in the final section. A Ni(111) surface was modeled by a periodic four-layer slab with a vacuum region of 15 Å in the z direction. The lower two layers were fixed in the bulk positions, while the upper two layers as well as the adsorbates were allowed to relax during geometry optimization and transition state search. All the DFT calculations were carried out using the program package Dmol3 in Materials Studio of Accelrys Inc. [45, 46]. The generalized gradient approximation with revised Perdew–Burke–Ernzerhof functional was utilized to account for the exchange and correlation effects . The basis set was set as double numerical plus polarization(DNP). The basis set superposition error calculation was not performed in this paper since it is very small and can be neglected . The core electrons of metal atoms were treated using effective core potentials, while other atoms were treated using an all electron basis set. Considering the magnetic properties of Ni, all calculations were spin-unrestricted. A 5 × 5 × 2 grid was used to generate k-points according to the Monkhorst–Pack method . The convergence criteria for geometry optimization and energy calculations were set as 1.0 × 10−5 Ha, 0.002 Ha/Å, and 0.005 Å for the tolerance of energy, maximum force, and maximum displacement, respectively. 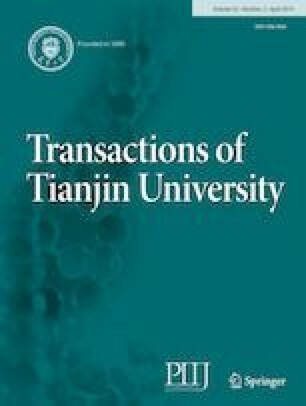 The transition state searches were performed at the same theoretical level as those for the reactants and products using the complete linear synchronous transit/quadratic synchronous transit (LST/QST) method . The adsorption energy, Eads, is defined as Eq. (1). where Eadsorbates/slab, Eadsorbates, and Eslab are the total energy of adsorbates on the surface slabs, total energy of the free adsorbates, and total energy of bare surface slabs, respectively. The reaction energy ΔE is calculated using Eq. (2). The activation barrier Ea is defined as Eq. (3). where EIS, ETS, and EFS refer to the total energy of the initial, transition, and final states, respectively. 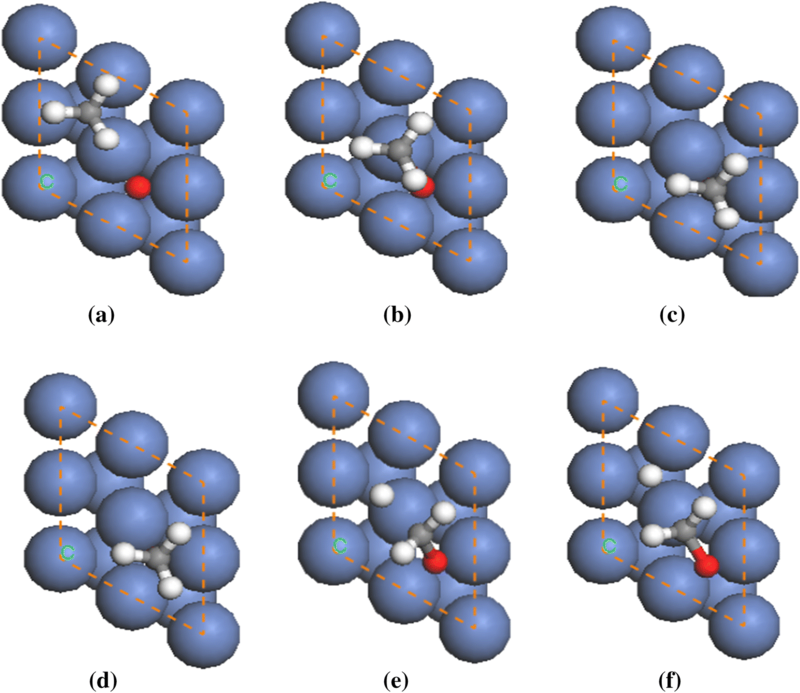 For the most stable (111) surface of metal Ni, mainly four adsorption sites exist: top site, bridge site, face center cubic (fcc) site, and hexagonal close packed (hcp) site, as depicted in Fig. 1. 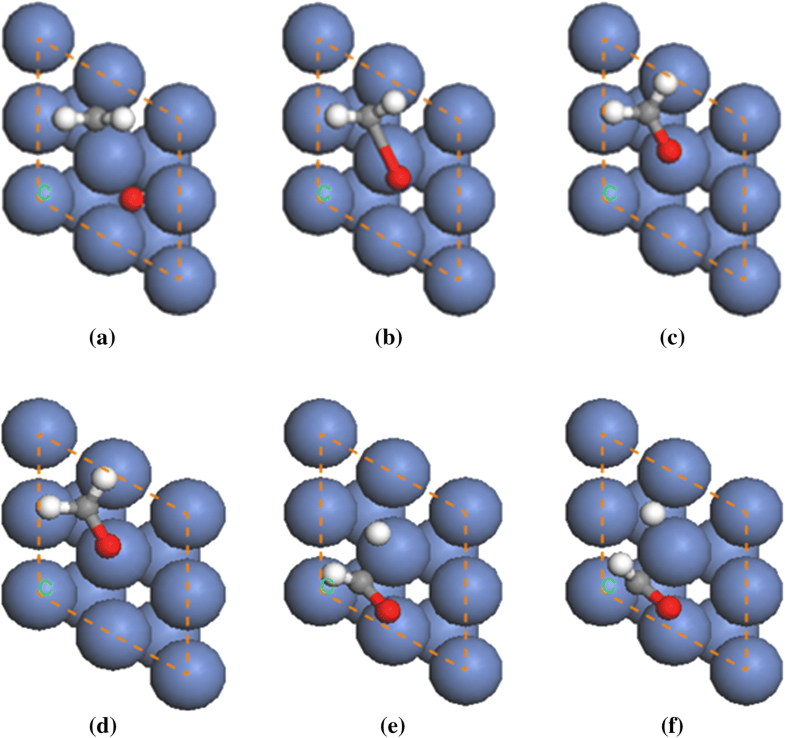 The adsorption energies of the O atom at each site were calculated, and from the results, we found that the adsorption energies of the O atom at the fcc, hcp, and top sites of Ni(111) surface were − 503.7 kJ/mol, − 503.6 kJ/mol, and − 343.0 kJ/mol, respectively. The O atom located at the bridge site can only form metastable adsorption system, which transfers to the threefold hollow site spontaneously. The results indicate that the O atom preferentially binds to the threefold hollow site on Ni(111) surface, which is in good agreement with the findings of the previous research . To clarify the influence of adsorbed O atom on CHx transformation, we first analyzed the interaction between the O atom and CHx (x = 0–3) species. The stable adsorption sites and corresponding adsorption energies of CHx species in the absence and presence of the O atom are listed in Table 1. The adsorption energies of CHx (x = 0–3) species were found to be significantly reduced on an O-preadsorbed Ni(111) surface compared to a clean Ni(111). This is not surprising since CHx needs partial energy to overcome the repulsion interactions with the preadsorbed O atom on the Ni(111) surface. CHxO species are the main intermediates of the reaction between CHx and O. We systematically studied the formation and dissociation processes of CHxO (x = 1–3) species, and the results are discussed in this section. CH3 and O atom can directly form CH3O on the Ni(111) surface. After optimizing the co-adsorption configuration of CH3 and O on Ni(111) surface, we chose it as the initial state of the reaction, as shown in Fig. 2a. CH3 and O atom were adsorbed at the hcp and fcc sites, respectively, and their co-adsorption energy was − 606.5 kJ/mol. Figure 2b shows the transition state of this reaction. The C atom and three H atoms were in the same plane, and the angle between C–O and Ni was 53.72°. The final state of this reaction is seen in Fig. 2c. The O atom of the CH3O was adsorbed at the fcc site of Ni(111) surface with C–O bond perpendicular to the Ni(111) surface; the interaction between CH3O and Ni surface was mainly achieved by the O atom. The reaction energy and the activation barrier of the reaction of CH3 + O → CH3O were 60.2 kJ/mol and 96.0 kJ/mol, respectively. According to the Mulliken analysis, as is seen in Table 2, C atom then became slightly positive charged from the negative charged state. This is because while the Ni surface interacted with the C atom of CH3 in the initial state (IS), it interacted with the O atom in the final state (FS) of the reaction. CH3O may directly dissociate into one H atom and CH2O. By optimizing the structures of the reactant and products of the reaction, we obtained the most stable structures, as shown in Fig. 2d, f. Figure 2e shows the transition state (TS) of CH3O dehydrogenation. The transferred H atom was adsorbed at the top site of the Ni(111) surface (a little shift to the bridge site), and C atom was adsorbed at the same site as H atom but a little closer to the fcc site, while the O atom was preferably adsorbed at the bridge site. The angles between C–O and Ni and between C–O and H–C–H were 44.04° and 133.50°, respectively. From the FS in Fig. 2f, we can see that the H atom was adsorbed at the hcp site of the Ni(111) surface, and the C atom of the CH2O was adsorbed at the top of the Ni atom, which was close to the H atom (a little shift to the fcc site), and the O atom was adsorbed at the bridge site. The angles between C–O and H–C–H plane and between C–O and Ni were 130.37° and 8.17°, respectively. The heat and activation energy of the dehydrogenation of CH3O on the Ni(111) surface were 62.8 kJ/mol and 102.1 kJ/mol, respectively. In the process of the reaction CH3O → CH2O + H, the angle between the C–O bond of the CH3O and the Ni surface was about 8.17°, while in the IS the C–O bond was perpendicular to the Ni surface. The distance between C–Ni and H–Ni gradually reduced. Both O and C atoms interacted with the surface Ni atom, but constrained by the high negativity of the O atom, the C atom connected with the Ni atom was not negatively charged, according to the Mulliken analysis, as shown in Table 3. There are two possible pathways to produce CH2O on the Ni(111) surface: the direct dehydrogenation of CH3O, which is discussed in the above section, and CH2 interaction with O, which is presented in this section. After optimizing the co-adsorption configuration of CH2 and O on the Ni(111) surface, we chose CH2 + O as the IS of the reaction, as shown in Fig. 3a. CH2 was adsorbed at the hcp site, and O atom at the fcc site. The co-adsorption energy of CH2 and O was 814.2 kJ/mol. Figure 3b shows the TS of this reaction. The FS of the reaction is presented in Fig. 3c. The C atom of CH2O was adsorbed at the hcp site of the Ni(111) surface, and the O atom was adsorbed at the top site of the Ni atom, which was adjacent to the C atom. The bond length of C–O was 1.347 Å and was parallel to the Ni(111) surface, and the angle between C–O and H–C–H plane was 44.78°. The heat and activation energy of CH2 + O → CH2O on the surface of Ni(111) were 21.4 kJ/mol and 133.5 kJ/mol, respectively. According to the Mulliken analysis results in Table 4, the negativity of the C atom gradually reduced. In the initial state, CH2 was electronegative overall, while in the FS it had a charge of 0.219e. In the FS, the O atom, in addition to bonding with C, also bonded with Ni atom at the bottom. CH2O may directly dissociate one H atom and form CHO. By optimization, we obtained the initial and final states of the reaction system, as shown in Fig. 3d, f, respectively. Figure 3e presents the TS of the reaction. In the TS, the transferred H was adsorbed at the top of the Ni surface, adjacent to the hcp vacant site, and the C atom was adsorbed at the fcc site, which was adjacent to the adsorption site of the H atom. Atomic O was adsorbed at the top site, which was a little close to the adjacent bridge site. The angle of H–C–O was 112.00°, and the angles between the C–O bond and Ni surface and between the H–C bond and Ni surface were about 18.39° and 43.08°, respectively. Figure 3f presents the FS of this reaction CH2O → CHO + H. Atomic H was adsorbed at the hcp site on the Ni(111) surface, and the C atom of CHO was adsorbed at the bridge site of Ni atom, which was separated by a Ni atom with the adsorption site of H atom. Atomic O was adsorbed at the top site (a little close to the adjacent bridge site). The angle of H–C–O was about 115.89°, and the angles between C–O bond and Ni surface and between H–C bond and Ni surface were about 18.44° and 45.35°, respectively. The heat and activation energy of CH2O → CHO + H on the Ni(111) surface were 13.8 kJ/mol and 56.0 kJ/mol, respectively. Data of the reaction are listed in Table 5, and the dissociation process of CH2O was similar to that of CH3O. Similar to CH2O formation, there are also two possible pathways for CHO formation: direct dehydrogenation of CH2O to CHO, which is discussed in the above section and combination of CH with O, which is included in our previous paper (for CH + O → CHO, the barrier and the reaction energy are 88.9 kJ/mol and − 19.8 kJ/mol, respectively). For CHO → CO + H, the barrier and the reaction energy are 28.7 kJ/mol and − 94.9 kJ/mol, respectively . In addition to the transformation of CHx via CHxO intermediate presented in the above section, there is another potential O-assisted CHx (x = 1–3) dehydrogenation route: CHx + O → CHx−1 + OH, which is discussed in this section. The reaction CH3 + O → CH2 + OH competes with the formation of CH3O, i.e., the reaction CH3 + O → CH3O. After we optimized the co-adsorption configurations of “CH3 and O” and “CH2 and OH” on Ni(111) surface, we chose them as the IS and the FS of the reaction, respectively, as shown in Fig. 4a, c. Figure 4b presents the TS. In the TS, the angles between two C–H bonds from the CH2 and Ni surface were 26.88° and 33.18°, respectively. The angle between O–H bond and Ni surface was 20.24°. In the FS, as is seen from Fig. 4c, CH2 was adsorbed at the hcp site, whereby the C atom shifted to the bridge site a little, and OH was adsorbed at the fcc site on the surface of Ni atom, which was separated by a Ni atom with the adsorption site of the CH2. As opposed to separate adsorption, in the co-adsorption, OH was not perpendicular to the Ni(111) surface, and the angle between them was about 45°. The co-adsorption energy of CH2 and OH was − 575.8 kJ/mol. The heat and activation energy of the reaction CH3 + O → CH2 + OH were 56.0 kJ/mol and 119.8 kJ/mol, respectively. In the TS, the bond lengths of H–C and H–O were 1.502 Å and 1.197 Å, respectively. Both C and O atoms were attracted to H atom to some extent, according to the analysis of Mulliken charge from Table 6. The charge of C was then − 0.641e, which was more electronegative than the IS, while O had a charge of − 0.634e, which was more electronegative than the FS. The transferred H atom had a charge of 0.317e, which was more electropositive than the IS and FS. In the reaction process CH3 + O → CH2 + OH, C and O simultaneously compete for H atom. When the O atom interacts with the H atom of the CH3 in the beginning, the charge in the H atom begins to transfer to the O atom. With the gradual increase in the interaction force between O and H, the H atom becomes positively charged. The interaction between C and the transferred H is not weakened, but is strengthened gradually until the TS. With increasing distance between C and H, the interaction between them gradually weakens, and thus, H and O form OH species. The reaction CH2 + O → CH + OH competes with CH2O formation, i.e., the reaction CH2 + O → CH2O. After the optimization of the co-adsorption configurations of “CH2 and O” and “CH and OH” on Ni(111) surface, we chose them as the IS and the FS of the reaction, respectively, as shown in Fig. 5a, c. Figure 5b shows the TS of the reaction. The angles between C–H and Ni and O–H and Ni were 73.95° and 80.22°, respectively. In the FS, CH was adsorbed at the hcp site, OH was adsorbed at the fcc site on the surface of Ni atom, which was separated by a Ni atom with the adsorption site of CH. Both CH and OH were perpendicular to the Ni surface, and the co-adsorption energy of the system was − 811.4 kJ/mol. The heat and activation energy of CH2 + O → CH + OH on the Ni(111) surface were − 2.0 kJ/mol and 105.1 kJ/mol, respectively. According to the analysis of Mulliken charge in the TS, as shown in Table 7, the C atom had a charge of − 0.477e, which was more electronegative than the IS, and the O atom had a charge of − 0.598e, which was more electronegative than the FS. The transferred H atom had a charge of 0.290e, which was more electropositive than the IS and FS. The trend is similar to the process illustrated in the above section. The distances between the transferred H and C and O were 1.480 Å and 1.355 Å, respectively. Based on the above results and our previous work , we explored the reactivity of CHx (x = 1–3) species on Ni(111) in order to screen feasible routes toward CO and identify the effect of adsorbed O on CHx transformation. Figure 6a presents the barrier heights of direct, O-assisted one-step, and O-assisted two-step dehydrogenation routes from CH3. The orange bar, which indicates the interaction between CH3 and O to form CH2 and OH, features the highest barrier of 119.8 kJ/mol, making this route the least likely for CH3 transformation. The direct dissociation of CH3 into CH2 having the lowest barrier (79.1 kJ/mol) is favorable. However, on O-preadsorbed Ni(111) surface, CH3 also has a chance to interact with O atom to form the CH3O intermediate, followed by CH3O dehydrogenation to CH2O since the barrier difference between this route and CH3 direct dissociation is not large. The relative barriers of three transformation routes for CH2 are displayed in Fig. 6b. Unlike CH3, both O-assisted one-step and O-assisted two-step dehydrogenation processes exhibit much higher overall barriers than CH2 direct dehydrogenation into CH. Thus, direct dissociation is preferable for the CH2 species. It should also be noted that the energy required for the dehydrogenation of CH2O to CHO is moderate, because only a barrier of 56.0 kJ/mol needs to be overcome. Figure 6c gives the energy bars for related reactions beginning from CH. The activation energies of CH + O → C + OH and CH → C + H are 148.9 kJ/mol and 140.5 kJ/mol, respectively, which block these reactions from proceeding. On the contrary, combining CH and O to CHO is much easier as the barrier is 88.9 kJ/mol. Moreover, the subsequent dehydrogenation of CHO to CO is quite easy since only a height of 28.7 kJ/mol needs to be overcome. Having obtained the above results and the insight from our comparative analysis, we propose two possible reaction pathways for CH3 transformation to CO, which are shown in Fig. 7. In the first pathway, by dissociating H atoms, CH3 is converted to CH2 and CH successively; then, CH interacts with adsorbed O to generate CHO, which further dehydrogenates to CO. In the second pathway, CH3 first combines with adsorbed O to form CH3O, which subsequently undergoes three dehydrogenation steps to produce CO. The adsorption energies of CHx (x = 0–3) were found to be significantly reduced on an O-preadsorbed Ni(111) surface compared to a pure surface. O-assisted one-step dehydrogenation of CHx (x = 1–3), i.e., CHx + O → CHx−1 + OH, contributes little to the overall transformation of CHx because of the high energy required to overcome the barrier. Direct dissociations of CH3 to CH2 and then to CH feature relatively lower barriers and proceed preferentially. However, the energy for scission of CH to C and H is as high as 140.5 kJ/mol. Interestingly, O-assisted two-step CH transformation to CO via CHO intermediate only needs to overcome a barrier of 88.9 kJ/mol, opening a quite feasible route. It should be noted that the successive dehydrogenations of CHxO (x = 1–3) are also favorable from the viewpoint of energy. Through comparison and screening, two possible pathways from CH3 to CO were found: (a) CH3 → CH2 → CH → CHO → CO; (b) CH3 → CH3O → CH2O → CHO → CO.